We are 6 weeks into the project, and allowing for the break between Christmas and New Year, things are going pretty smoothly. 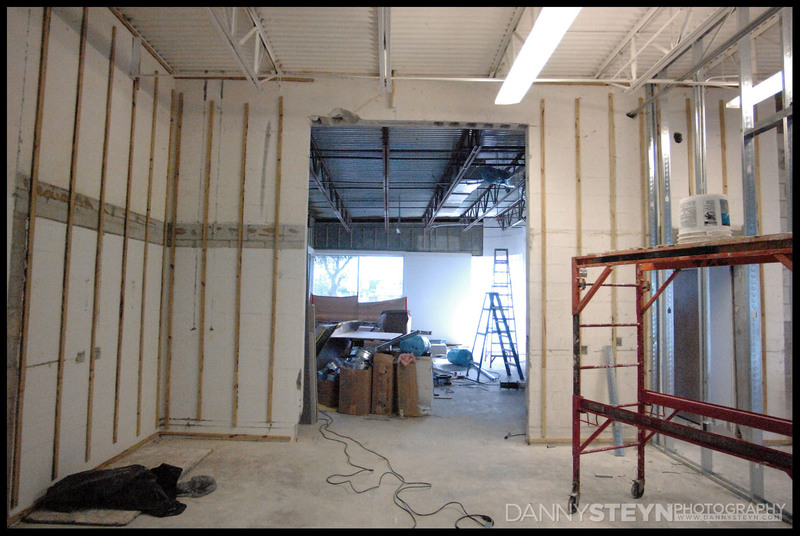 The GC is keeping the project moving along, but to date we have drifted about 2 weeks behind our original schedule. Not a train smash but still a bit disappointing. 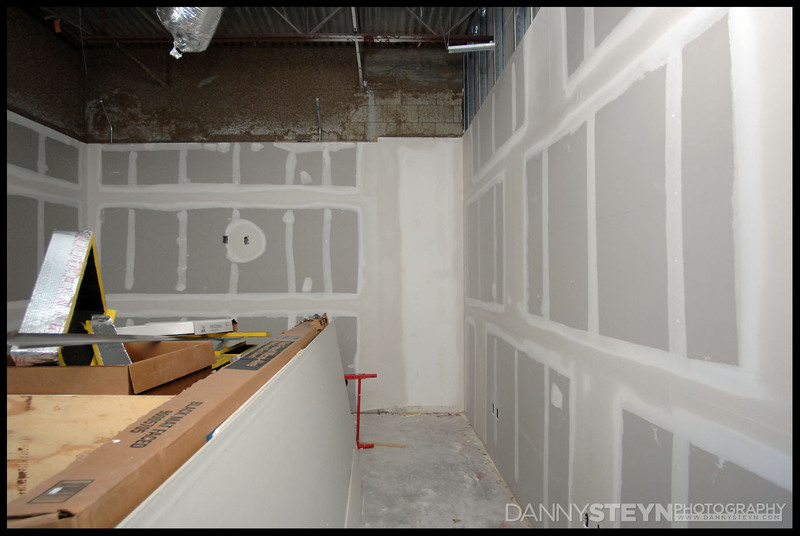 All the interior drywalls are all complete. 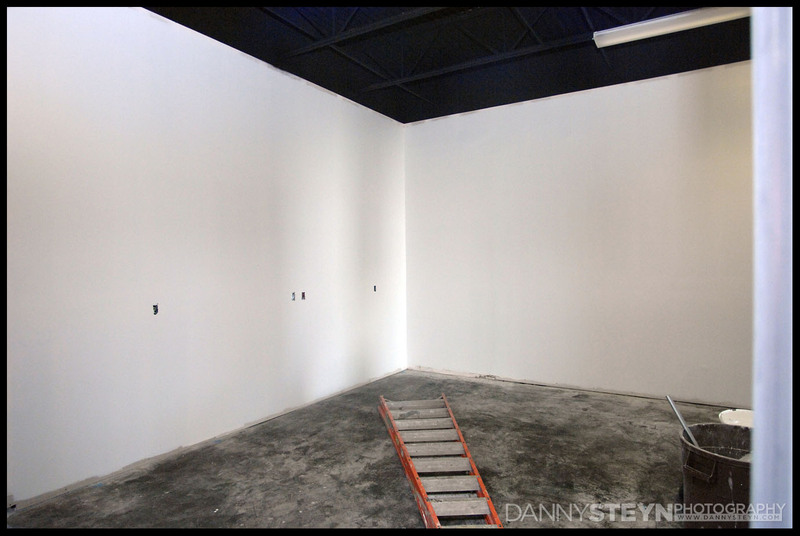 Both Studios as well as the Prop Room and the Gallery will have open ceilings, and these areas all received their dose of matte black paint. 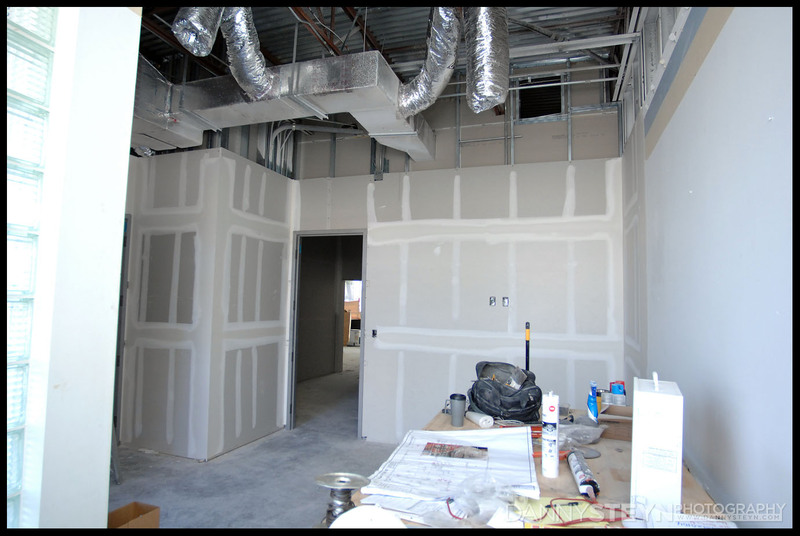 There will be some touch up required with the new AC vents that are still being installed. 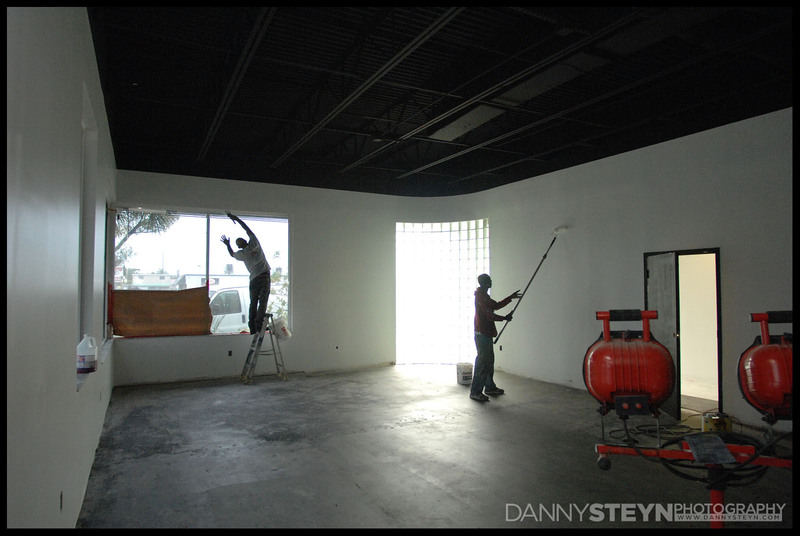 Photography studio Lobby dry-wall complete. 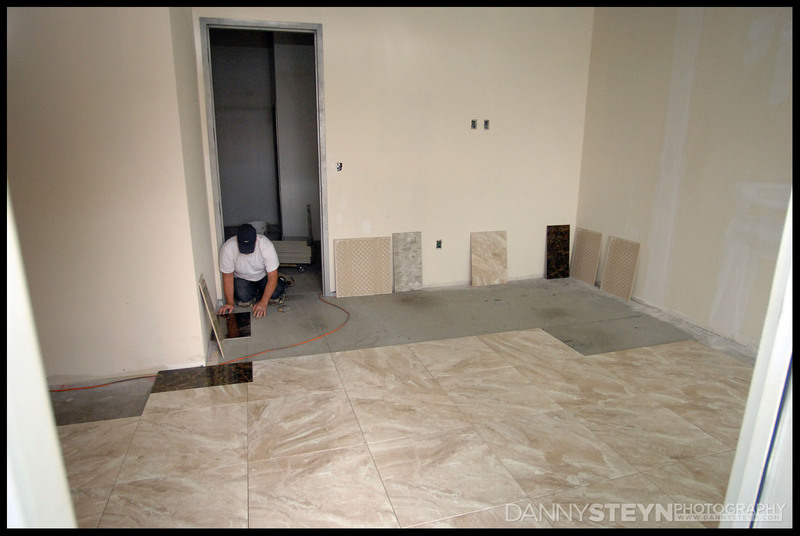 The floor guys have started laying tile in the Lobby, Office and Gallery areas. 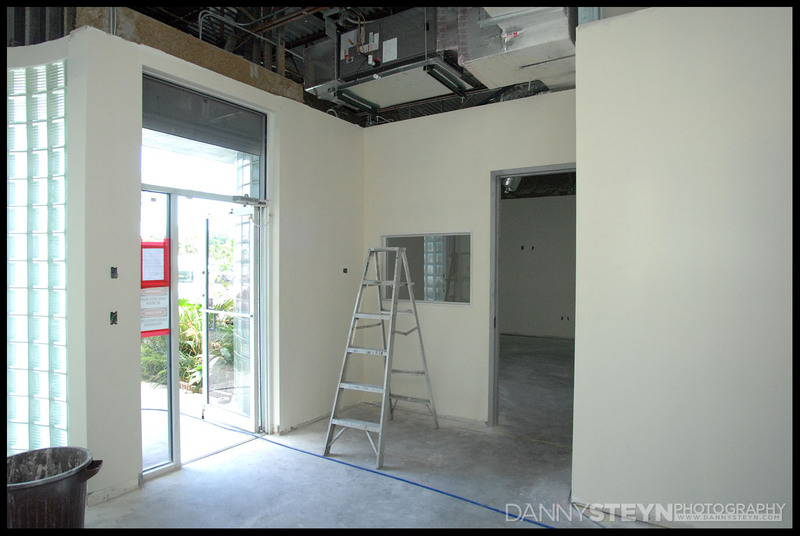 We had to make a small design change in the Lobby due to the layout of the doors. 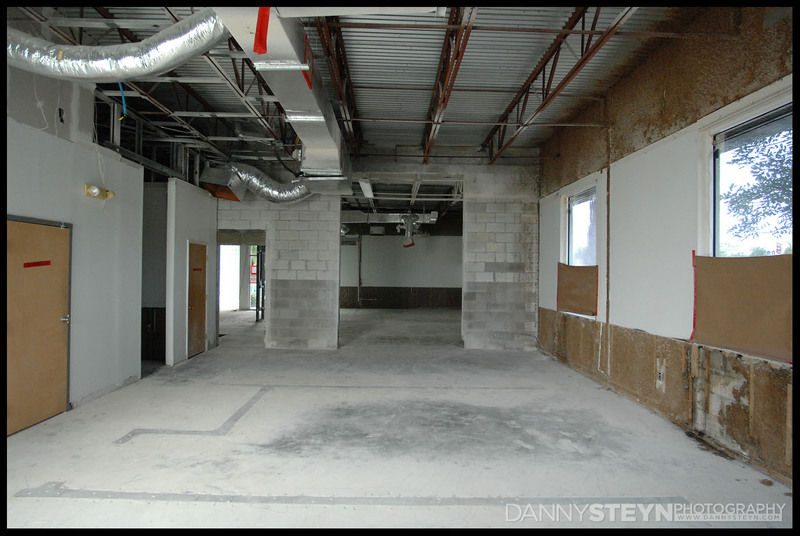 Unfortunately this means more of one tile and less of another so the lobby will only be completed on Saturday. We had so many compliments on the lobby of our old studio that we have stayed with the same floor design; a dark marble border around a light marble fill. 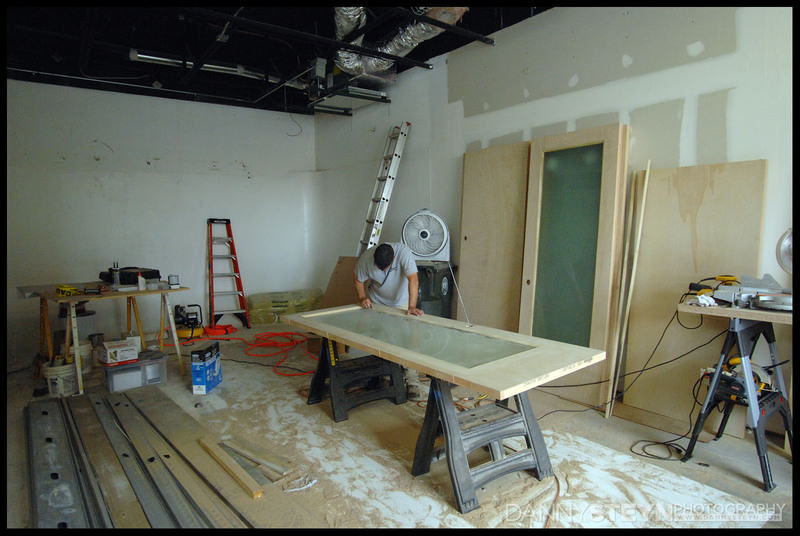 Doors will be black with frosted glass panels. 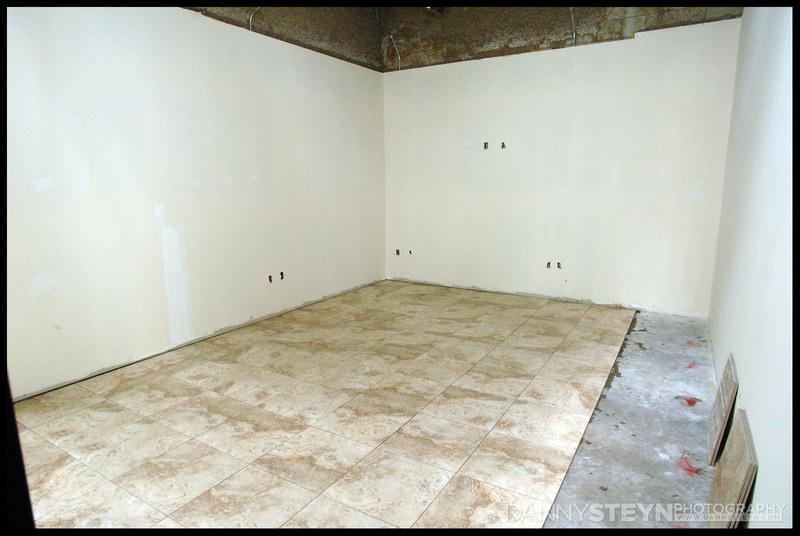 We chose a busier and slightly darker tile for the Editing Room as the light cream tiles in our previous studio editing room showed the dirt too easily. 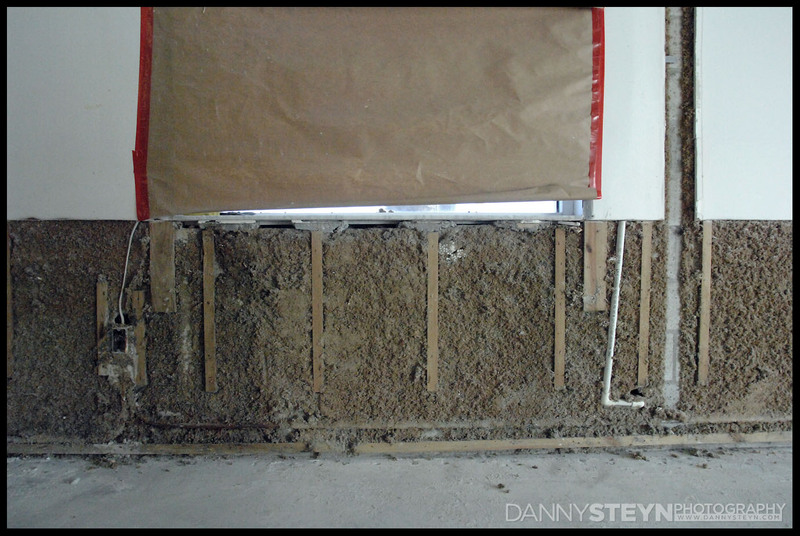 With the structural inspections complete the drywall crew continued their task and now the tape and mud is being applied. 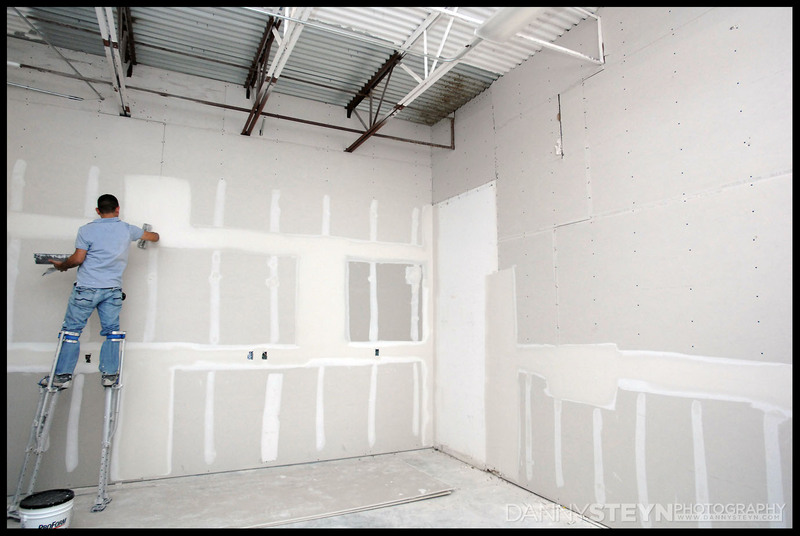 Open ceilings in the two studios, gallery and prop room mean 12ft tall walls have to be dry-walled and smoothed. Looking forward to seeing the crew’s tall stilts on the high walls! 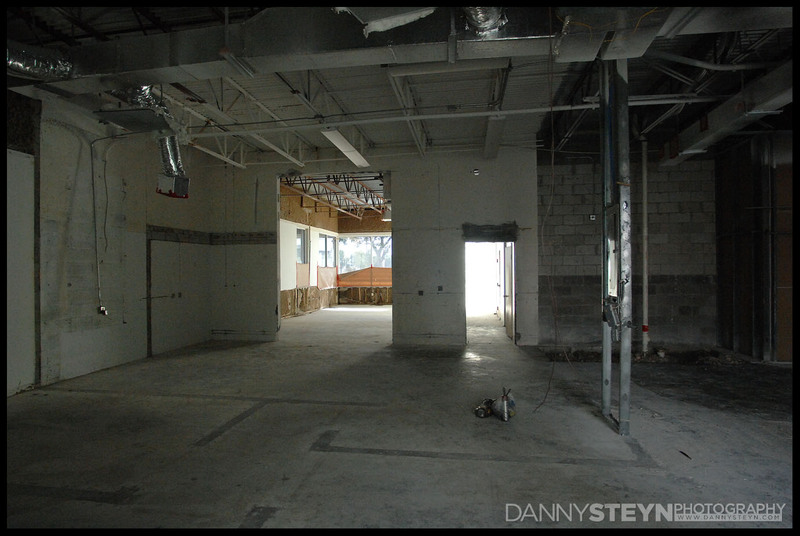 There will be a drop ceiling in the lobby, editing office, bathrooms and kitchen/makeup areas. 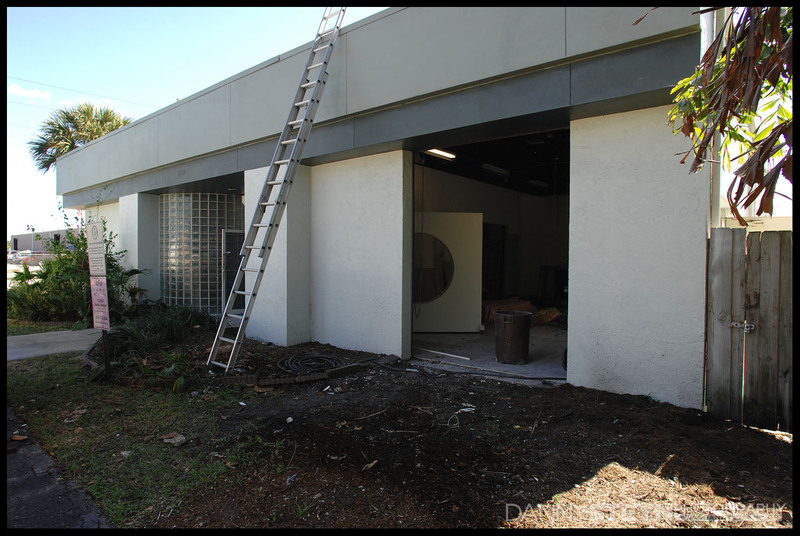 We decided to remove some of the overgrown vegetation to reveal the front of the building so that the signage will be visible to the 50,000+ vehicles a day that pass the studio. 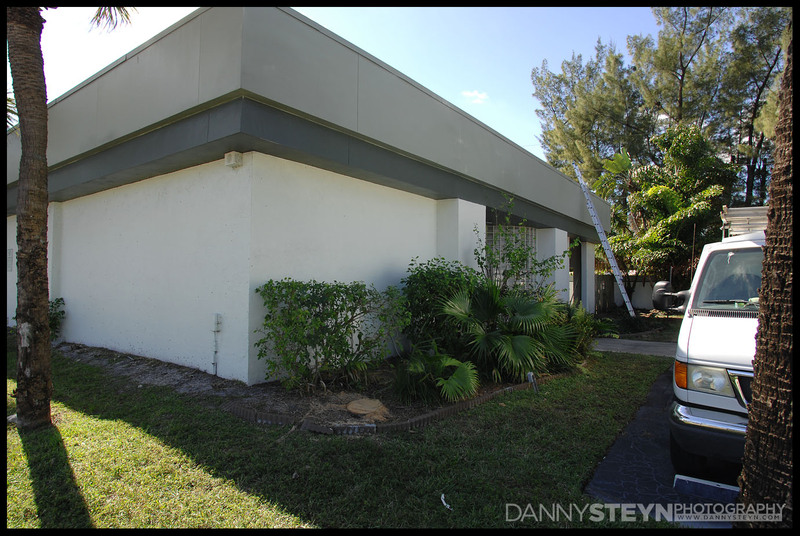 We are playing with signage design, paint colors as well as exterior landscaping. Kind of cool to see the exterior moving along as well. 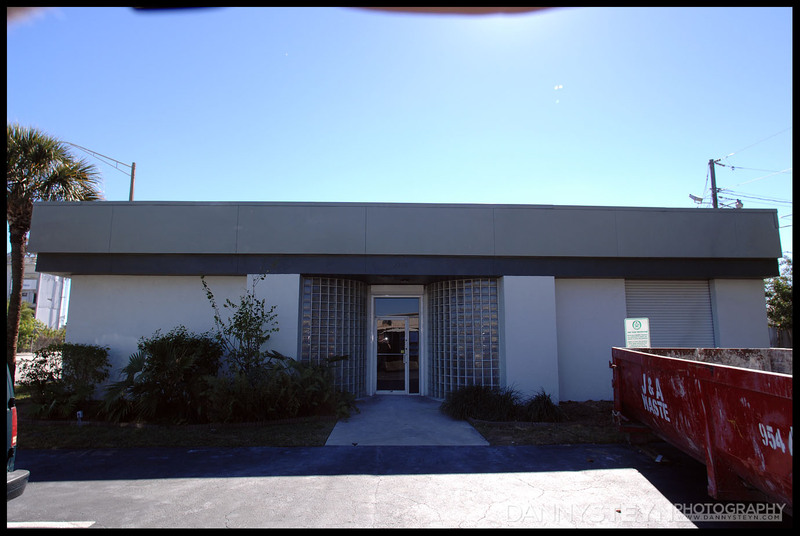 Completely upgrade the AC system with 4 new units supplying 12 Tons. 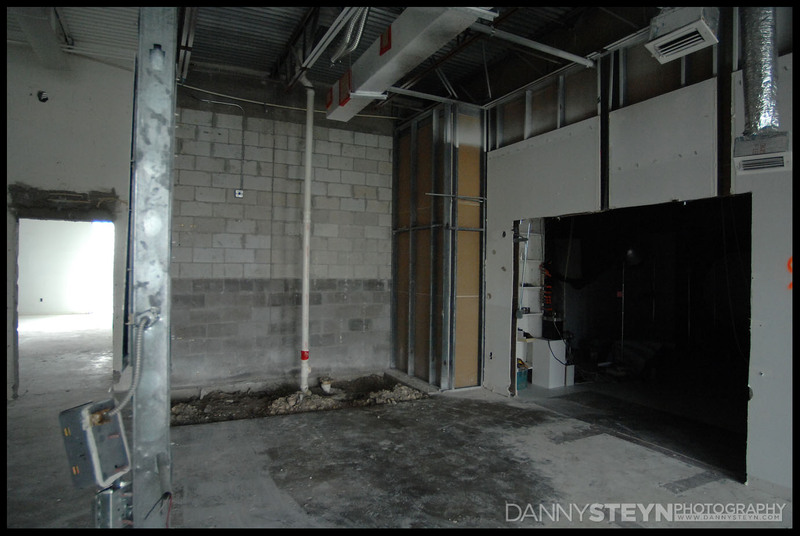 It’s pretty obvious that the 20 year old A/C system will not be able handle the demand of the new studio design. 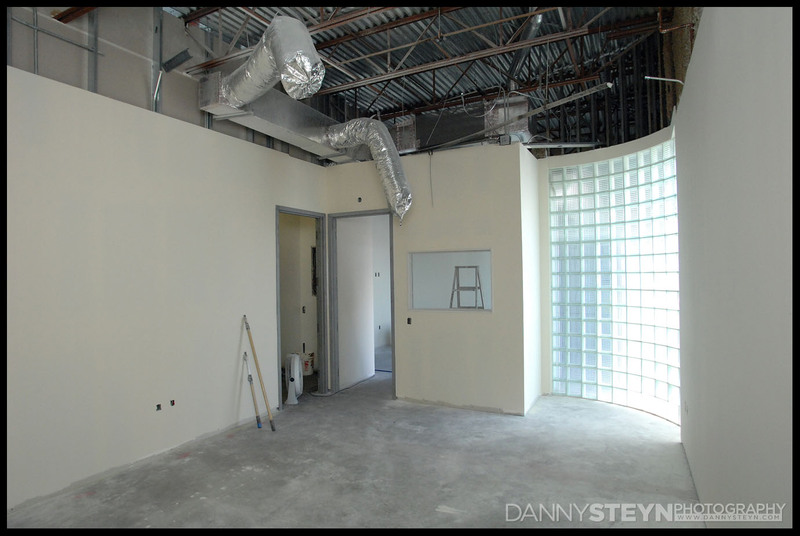 The plan is to run the A/C every day to cool the editing office, lobby, gallery and bathroom, but only run the A/C in the studios during shoots. So the ability to rapidly drop the temperature in the two large studios is essential. 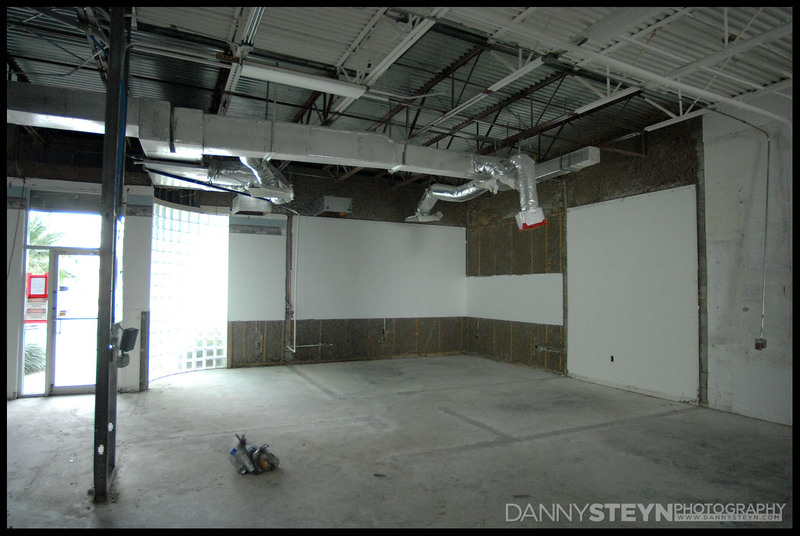 Without dropped ceilings, and a relatively low R19 roofing system, excess capacity will be important to get the temps down fast enough in the summer months. 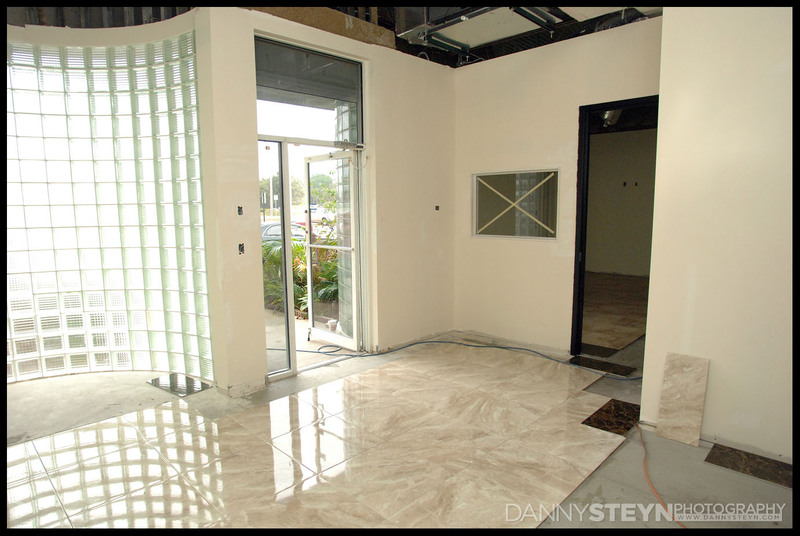 It’s also time to decide on tile treatments for the lobby and gallery areas. Fortunately Kim’s excellent taste for interior decoration will make my life so much easier. 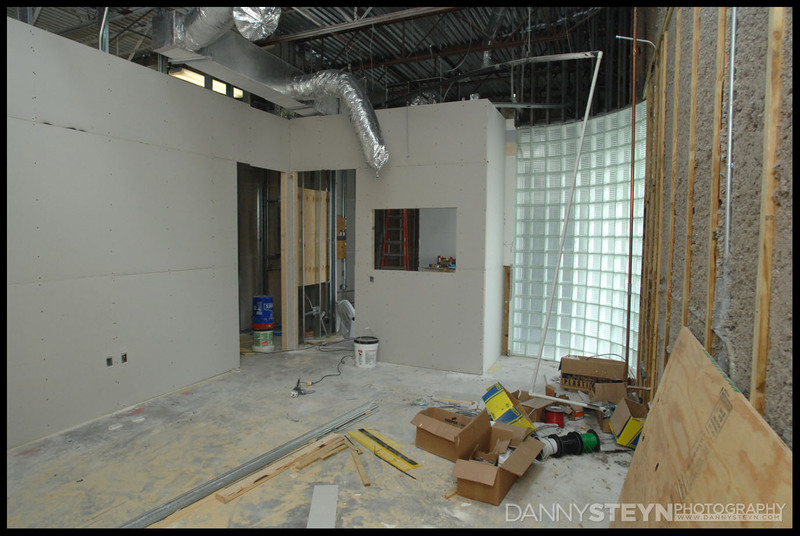 Dealing with the city building department for building permits and inspections can be a trying process. Sometimes it goes well, other times it can be a nightmare. I guess this time around ours was smack in the middle. 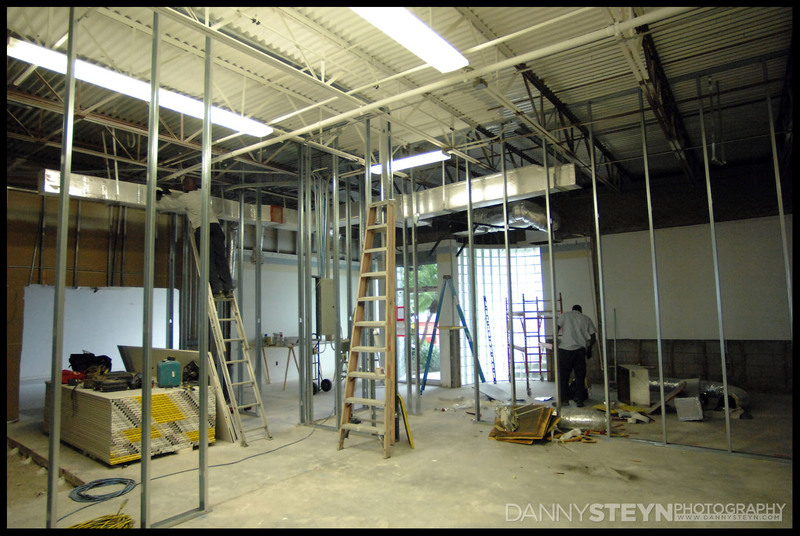 All our drawings and permits were passed without revision, however our plans got stuck (and lost) within the building department for almost 2 weeks, delaying all progress. And delays cost money. 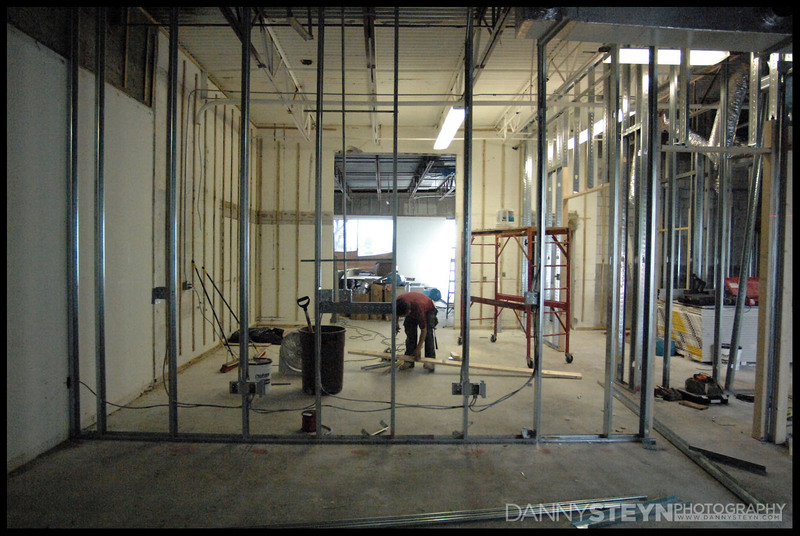 Now that we have the permits the build-out has started. 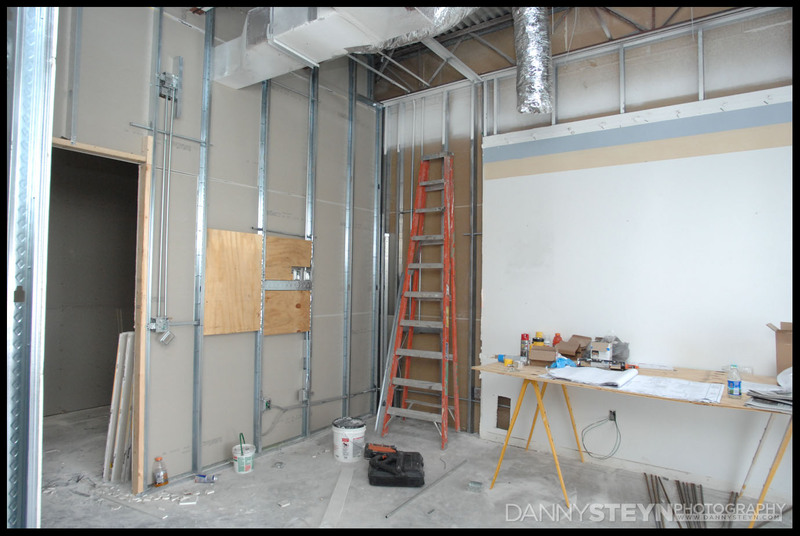 Drywall framing is going up, plumbing for the new ADA bathroom and kitchen, duct work for the new AC units and more. 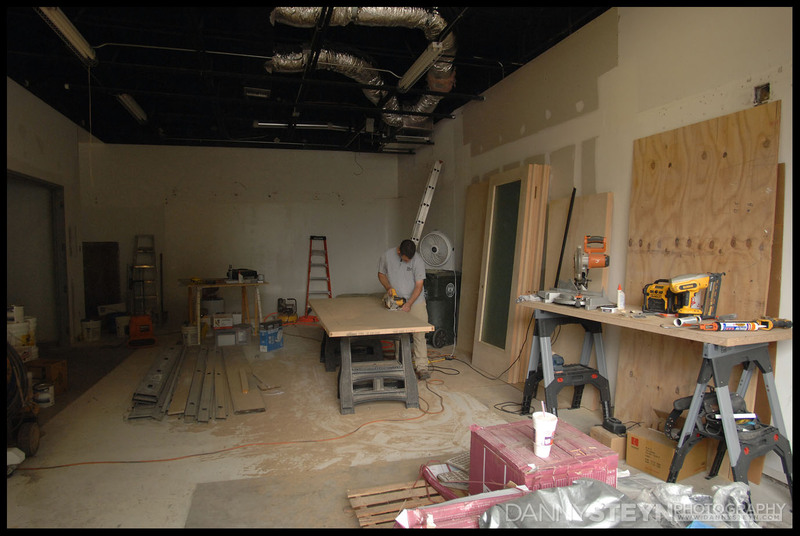 Despite having tried to incorporate as much pre-planning into the design of the new studio as possible, there are several changes that we have implemented through the project and sometimes construction delays give you time to reflect and rethink your strategy! 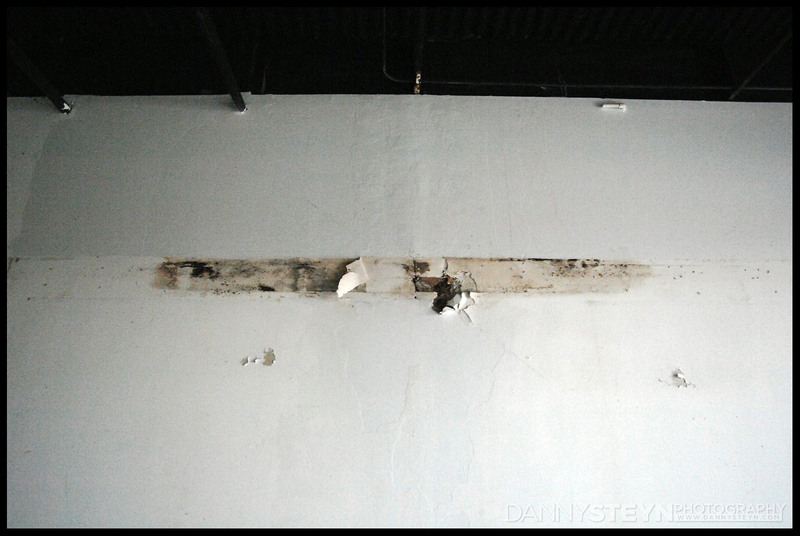 After removing a storage shelf we discovered this drywall rot in the Main Studio. Need to establish what is causing this. 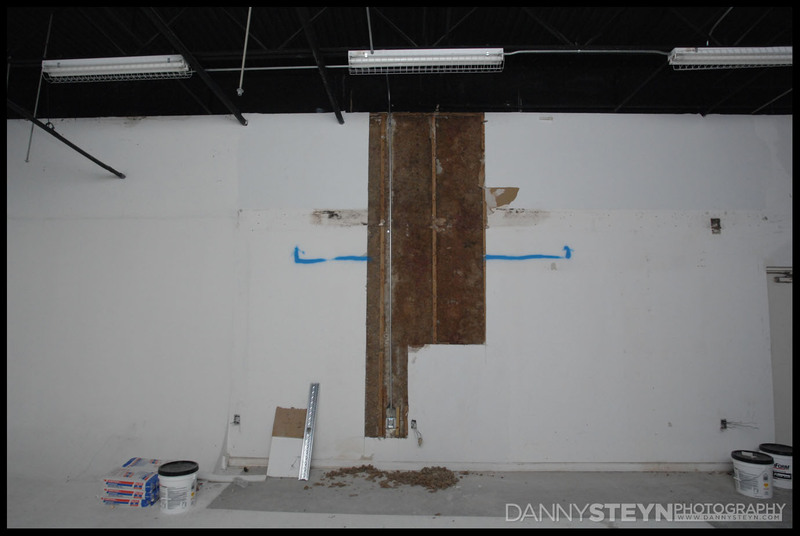 The empty main Portrait Studio with cyc wall and newly discovered leak and drywall rot! 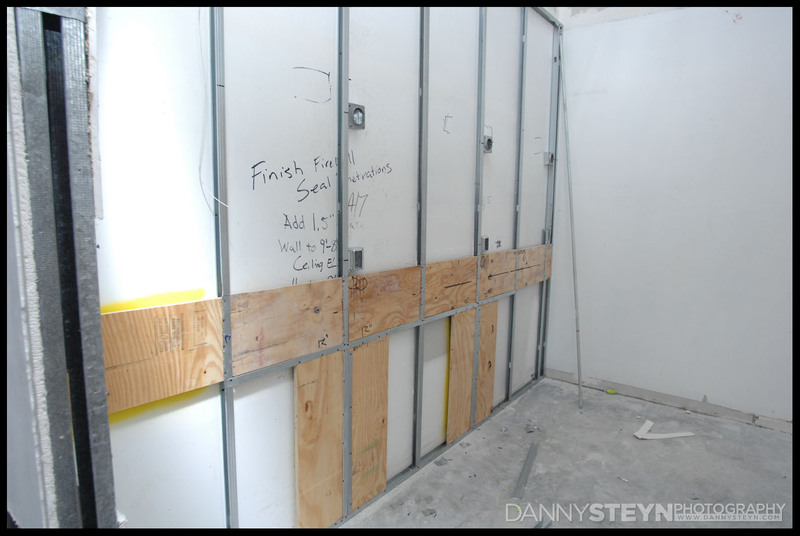 Plywood bracing for makeup counter in the Makeup Room. One full width mirror with lighting for 3 stations and outlets for hairdryers, curling tongs etc. 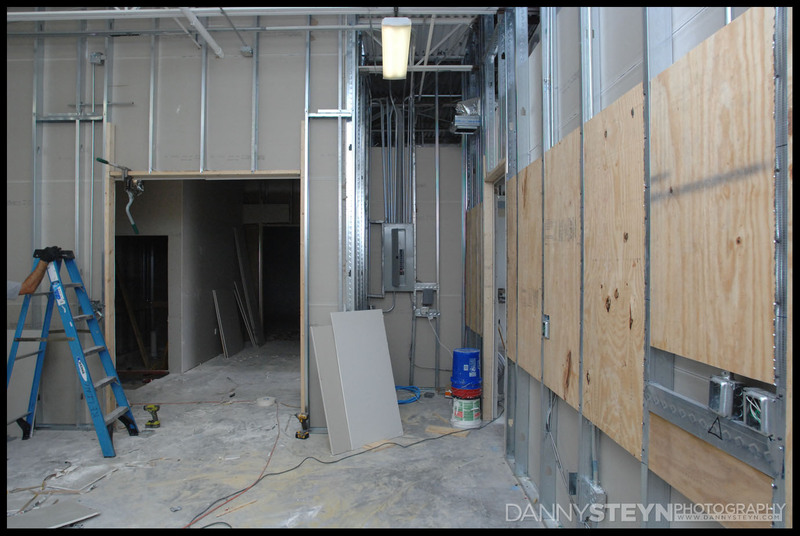 Plywood bracing for large HD 4K TV Monitor in the Lobby. 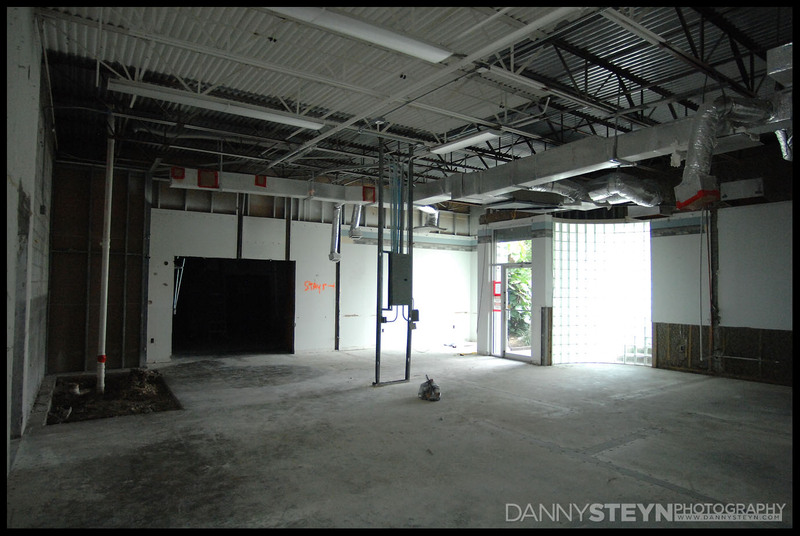 Now that the demo is complete the empty structure looks so full of potential. 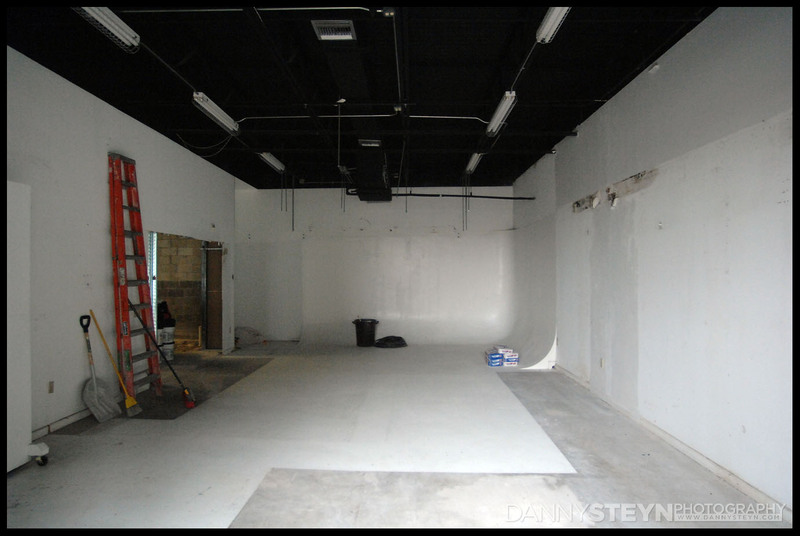 While we love the idea of on large completely open shooting space, the reality is that we are able to get more out of the studio with two separate shooting spaces and a prop room that services them both. 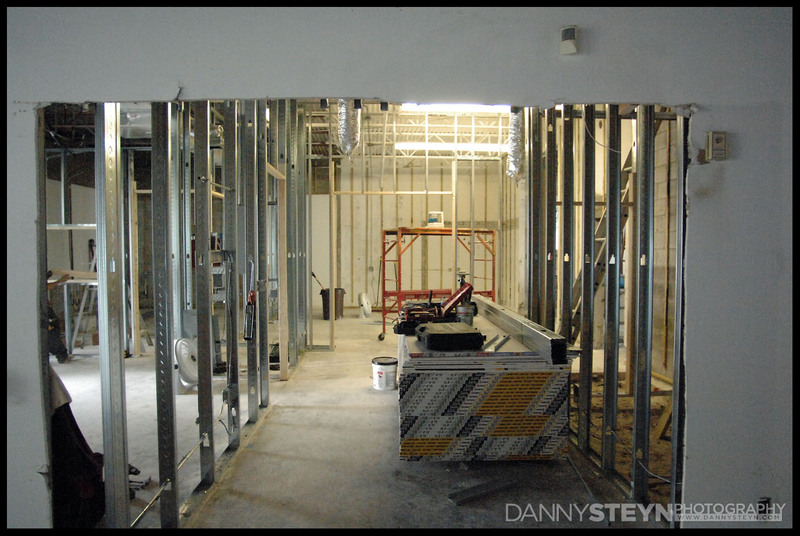 So, for now, we are enjoying the wide open space as it will soon be framed out in our new layout.